I would like to talk about one of the more enduring motifs in wallpaper design, the trellis, or diamond trellis to be more specific. This bamboo design is from the Royal Pavilion at Brighton (completed 1823) which was the residence built for George IV, Prince of Wales. This is about the earliest this motif shows up as an all-over wallpaper pattern. This paper was used in the Duke of York’s bedroom, George IVs brother. The Pavilion contained a great variety of wallpaper designs and this pattern was likely used as a border to accompany another paper. This intricate design of bamboo even contains trellis-work in the voids of alternating rows. The trellis motif appeared much earlier on gilded embossed leathers but was always a motif used to ornament another motif; it didn’t fill the entire background. Around the 1860s, the same trellis framework appears but is frequently covered with lush flowering vines. Around 1905 these flowers were replaced by grapes, with grape-encrusted papers hanging in many dining rooms across the land. 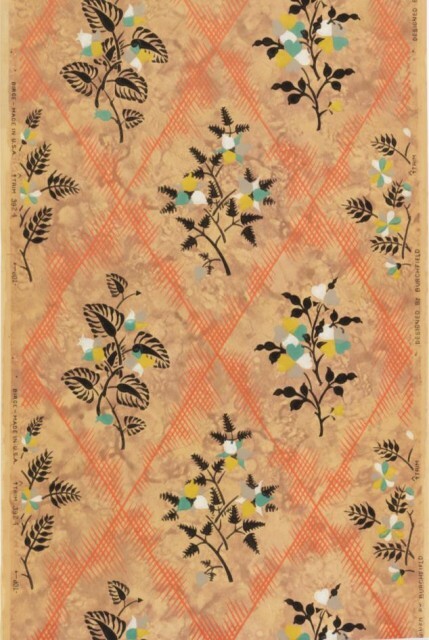 In the 1920s American watercolorist Charles Burchfield designed a trellis wallpaper with floral inserts (see left image), and in the 1930s English painter and illustrator Edward Bawden included star motifs on his trellis pattern. In this period the wallpaper would have been used on all four walls, floor to ceiling, or wainscot to ceiling. I remember an episode of Betty Boop from 1934 called Betty in Blunderland, a spoof on the Lewis Carrol tale, in which Betty has an elegant diamond trellis wallpaper in her living room. In the 1950s the trellis pattern morphed into the harlequin papers (see right image) which contained an identical format except the trellis structure was replaced by solid blocks of diamond-shaped colors. 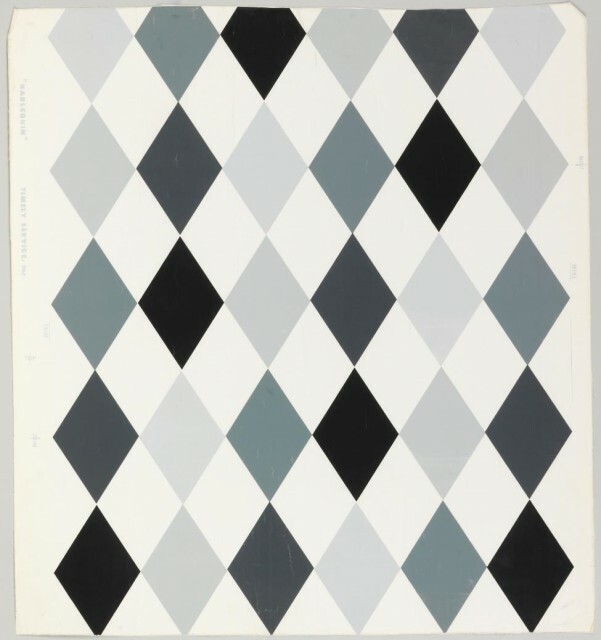 The harlequin papers contained a more dominant pattern and would most likely be used as an accent paper covering one wall, with a coordinating paper on the remaining three walls. Sidewall, England, 1813–23. Block-printed on handmade paper. Gift of Brighton Art Gallery and Museum.